1. 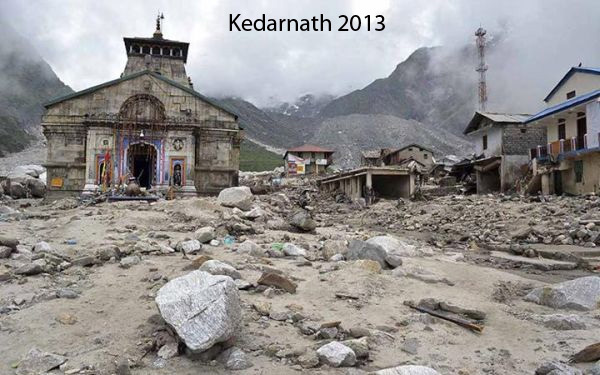 During 13 –17 June 2013, heavy rainfall occurred in the northern Indian state of Uttarakhand and led to one of the worst floods and landslides in history, resulting in more than 5000 casualties and a huge loss of property. This event also affected other parts of India including Himachal Pradesh, Haryana, Delhi and Uttar Pradesh, as well as western Nepal and parts of Tibet. 2. In a study by scientists, meteorological and climatic conditions leading up to this rainfall event in 2013 and similar cases were analyzed for the period of 1979–2012. Using complex meteorological models to study natural and anthropogenic influences as well as the role of the long-term climate trends on rainfall in the region it was found that:- Northern India has experienced increasingly large rainfall in June since the late 1980s. The increase in rainfall appears to be associated with a tendency in the upper troposphere towards amplified short waves. The phasing of such amplified short waves is tied to increased loading of green-house gases and aerosols. In June2013, 60–90 % of the rainfall amount was attributed to post-1980 climate trends with another study revealing that though this rainfall was at least a century scale event, the probability for such an incident recurring has increased in the present climate compared to that of pre-industrial times. In July2010, an extreme rainfall event in northern Pakistan resulted in floods that killed about 3000 and affected around 20 million people. More recently (2–6 September 2014), some regions in India (Jammu and Kashmir) and Pakistan (Azad Kashmir, Gilgit-Baltistan and Punjab) suffered extreme floods caused by heavy rainfall which killed more than 500 people. 4. The study found that increased levels of greenhouse gases and aerosols in the post-1980 period have caused changes in the upper troposphere and that as a result of anthropogenic climate change, the circulation structure has been modified in such a way that it significantly aggravates rainstorm occurrences in northern South Asia, hence increasing the severity of floods. 5. Also, the occurrence of this June 2013 event during pre-monsoon season in northern South Asia, along with the circulation and precipitation trends in June, calls for the adaptation of risk management strategies in the face of increasingly frequent and strong rainstorms outside the core monsoon months (July–August). Adaptation measures such as developing strategies and policies for flood management in the face of climate-related extreme events are urged. 6. In addition, the amplified upper-level stationary waves and associated dynamics, as revealed in this study, will need to be represented accurately in the forecasting tools revealed in the post-1980 trends is attributed.
" It appears that the increase in aerosols due to pollution, combined with changes in the jet stream due to increasing greenhouse gases, have made June events like the 2013 flood more likely to occur since 1988."